The Marquee Wallsaver Power Recliner from Bassett features antique brass nailhead trim and a power headrest option. The power headrest allows you to adjust the upper back cushion for the perfect neck and head support. It reclines with the touch of a stylish button on the side of the sofa. In 100% Top Grain Cowhide Leather, it has Vinyl on backs and sides. The Marquee has perfectly filled bustle backs, pleated arms and T-cushion fronts. The harp shape of the roll arm further emphasizes it's traditional styling, and double-needle, accent stitching helps add to the Old World feeling. 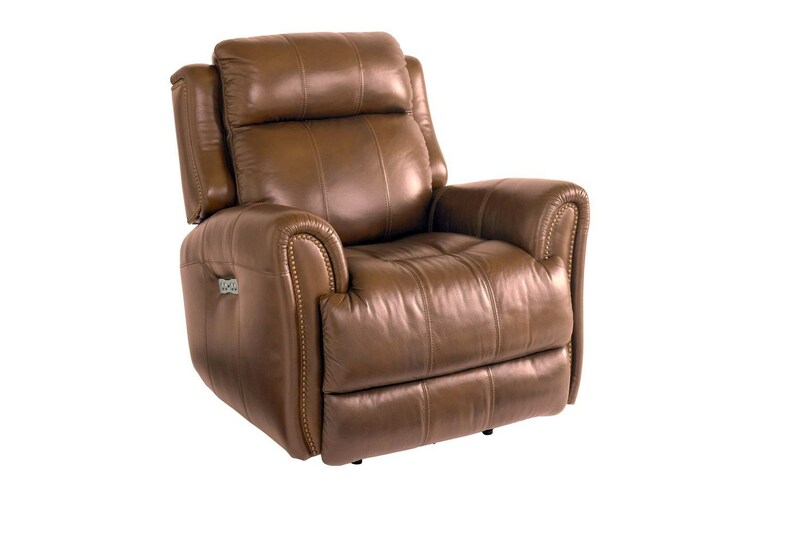 The Marquee Umber Leather Power Wallsaver Recliner with Power Headrest by Bassett at Great American Home Store in the Memphis, TN, Southaven, MS area. Product availability may vary. Contact us for the most current availability on this product.